The Coinage Act of 1890 gave the director of the mint “permission” to change the design of U.S. coins without requiring prior congressional approval. While this wasn’t required, then U.S. Mint director Robert W. Woolley felt a design change was necessary and, since prior Presidential administrations pushed to have the non-silver coins redesigned and issued, designs to replace the Barber dime, quarter and half dollar were sought. After several design changes, the design for the quarter by Hermon Atkins MacNeil were approved. 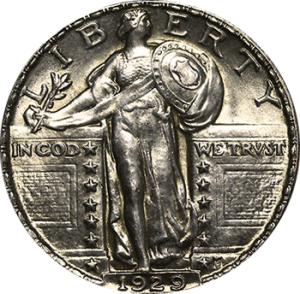 The Standing Liberty Quarter was issued from 1916 through 1930. There were three significant design changes during the mintage of the Standing Liberty Quarter. The first design changes occurred in 1917 and affected both sides of the coin. The most major redesign was the redistribution of the 13 stars on the reverse from 7 on the left and 6 on the right (Type 1) to 5 on each side and 3 under the eagle and the relocation of the eagle to accommodate 3 stars underneath. The other design change in 1917 was the addition of chain mail to cover Lady Liberty’s bare breast on the obverse. These changes culminated the Type 2 Standing Liberty Coin. 1925 saw the third design change which then became the Type 3. The area around the date was redesigned since the date wore rapidly on the previous designs. 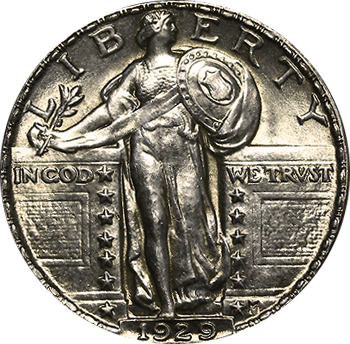 The Standing Liberty Quarter adhered to government regulation as to metal content. It is 90% silver and 10% copper. They are 24.3 millimeters in diameter and weigh 6.3 grams. They were minted in Denver, Philadelphia and San Francisco and the mint mark is located just above and to the left of the date on the obverse. While most Standing Liberty Coins in average circulated condition are in the $20-$50 range (with 1928 and later in the $10 range), there are some rarities. The quarters struck in 1916 and the 1918/7-S doubled die are amongst the rarest and command the highest prices. However, there are a few years/mintages that also command a somewhat higher price than commons do. These are the 1919-D and 1919-S which run in the $150 range and the 1921 and 1923-S Standing Liberty Quarters which are in the $400 range for average circulation quality.